Big Trees was without question the most heavily photographed railroad stop in Santa Cruz County. Tucked in the crook of a bend in the tracks between Felton Depot and Felton Junction, the station catered to the Welch Big Trees Grove and the Cowell/Hopkins Big Trees Resort (see Curiosities: Big Trees Resorts). The Welch family park was already in operation when the South Pacific Coast Railroad built its route alongside the eastern edge of the Big Trees Grove. Despite opposition from the family, the railroad successfully cut its route through an embankment, narrowly missing a massive redwood tree that remained on timetables as a clearance obstacle until Roaring Camp purchased the line in 1985. With the route completed in May 1880, Big Trees station opened for business. 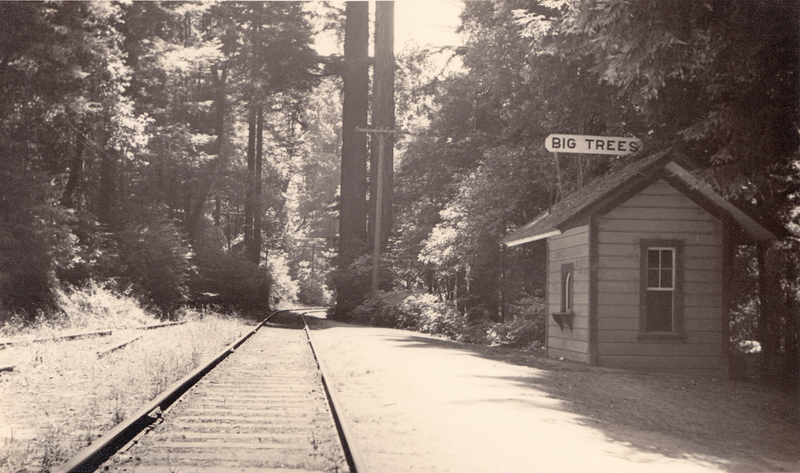 The South Pacific Coast Railroad did not build a station for Big Trees—only a sign marked the stop. However, the railroad installed a 202-foot-long siding on the east side of the tracks to park excursion trains. Little changed at the station for the first two decades. The station sign sat above the entrance to the Welch Grove, beside which stairs brought people down to the Frémont Tree and into the park. By 1900, a wood platform sat beside the tracks with a long bench installed alongside the railing. New wooden stairs were installed and a notice board sat at the end of the platform, but the station offered no ticket or telegraph services. The Big Trees station booth at its original location above the Welch Grove soon after it was built, c. 1890. 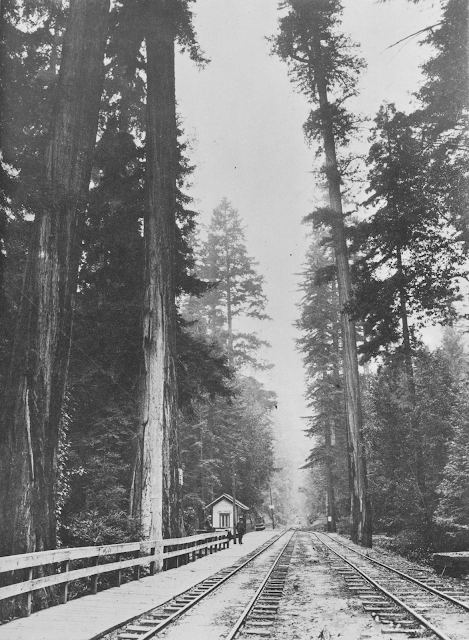 When Southern Pacific leased the South Pacific Coast in 1887, they soon installed a station booth at Big Trees to support seasonal excursion service to the site. The booth was installed near the southern end of the platform and only operated during the summer. It offered only ticket service, although telegraph wires overhead suggest it may have also had telegraph capacity, although it did not offer this commercially. At the same time, the passenger platform was lengthened considerably to the thick redwood tree located just before the track turned to cross the San Lorenzo River. A wide-angle shot of Big Trees station after the booth had moved, c. 1920s. 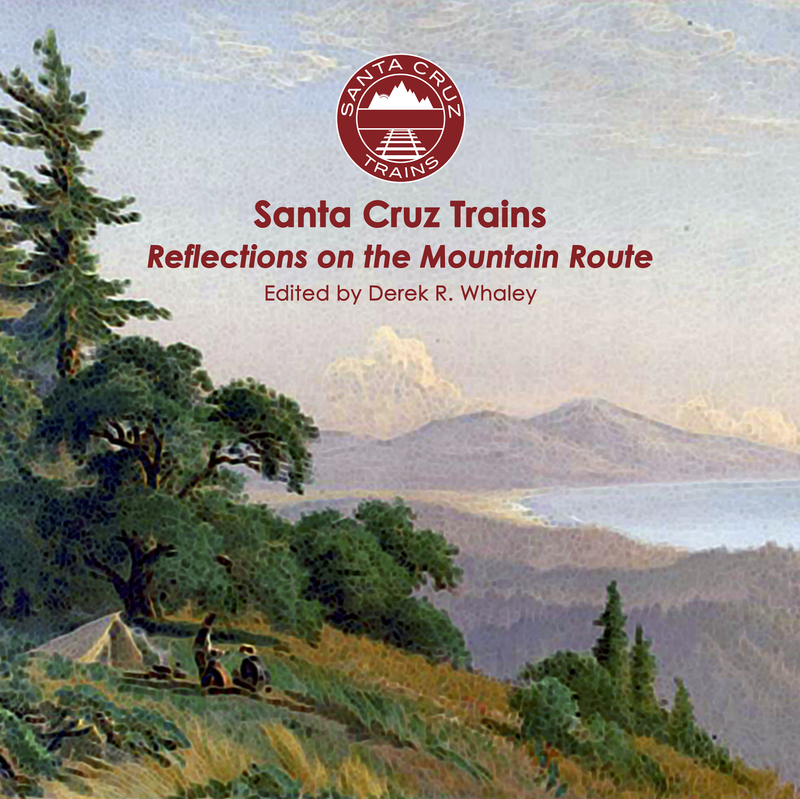 Everything changed in 1901, when Henry Cowell, who owned the majority of the property to the south, decided to open up a resort of his own that would cater specifically to railroad traffic. Cowell's Big Trees grew quickly and Cowell had the pull with the railroad to relocate the station booth slightly to the south. Meanwhile, the wood platform and stairs above the Welch Grove were removed and the entrance to the grove relocated to face Cowell's property, but tall fences were installed to keep onlookers out without paying their entry fees. 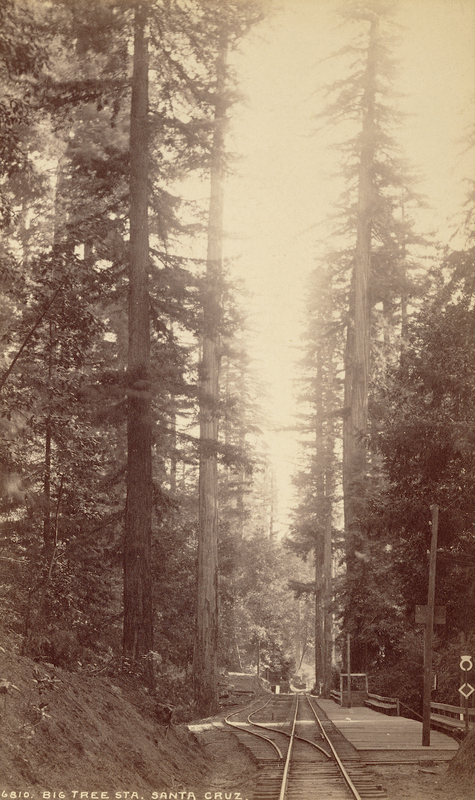 Cowell's property, which included far fewer old-growth redwoods, was free to the public. To support this new location, Cowell put in broad stairs to welcome people onto his property. Big Trees station in its final years, with the siding no longer connected to the mainline, c. 1930s. 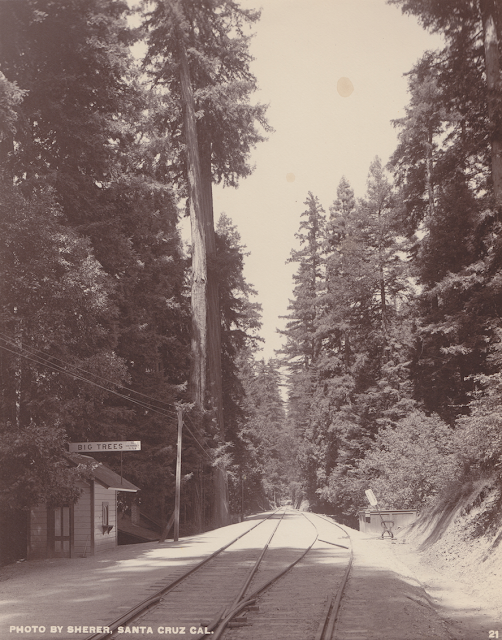 The standard-gauging of the tracks and siding at Big Trees in 1908 was the last major improvement to the site. The new siding measured 519-feet-long and could support most of the excursion trains that ventured to the park. Over the decades, the siding fell into disuse and became overgrown, even though occasional trains would still use it, when necessary. 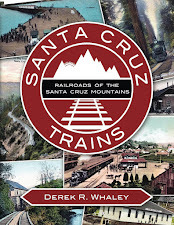 In 1930, also, the Welch Grove was purchased by Santa Cruz County and a new entrance for it appeared further to the north. Cowell's Big Trees limped along for another decade, enduring the closure of the route through the mountains to San José and finally closing its doors in 1942, after the start of World War II ended excursions to both parks. The station booth was removed soon afterwards, in December. When excursion service resumed in 1947, most trains stopped at the northern stop, although photographic evidence suggests a few trains still stopped at the old Big Trees station. Big Trees was finally abandoned as an official stop at some point after 1965, when the route was demoted to a freight-only line. The sign lingered on into at least the 1970s before disappearing. The site of Big Trees station is easy to determine. The original station was near the base of a tree just across from the Frémont Tree that sits beside the tracks. A glass insulator cap originally was placed on the side but has fallen off in recent years, but the wood knob that held it up remains on the side of the tree. The station hut was located roughly midway between this tree and the large tree that sits beside the tracks to the south, just before the turn toward the bridge. Nothing remains of the station or platform, but the area is still mostly clear of debris from years of heavy ballasting and harder soil. The siding space where excursion trains parked and locomotives turned around is clearly visible on the east side of the tracks in this area, where a culvert with the date 1912 can be found. While trespassing is not technically permitted, it is never enforced in this area – just check both ways when viewing the right-of-way at Big Trees. These tracks are still active. The black and white photo of the narrow-gauge heading northward past the ticket booth, if one uses a larger copy of the photograph found online (or has a monitor that will enlarge the above photo sufficiently), shows a road at the far end of the platform. The Big Trees Hotel would be on that road, and above track level. Maybe I'm seeing it wrong, but the road looks to be descending from some hill, possibly crossing the tracks, using a cut on the east side to circle about and meet the tracks that form the siding. I don't see what you see, Grant. I've got the photo at the larger resolution and I don't see a road at the far end. This was the original station booth, built for the Welch Grove before the Hopkins Big Trees was built and the station relocated further south. The stairs down to the hotel clearing is directly behind the booth, but there's no road that I see and I wouldn't know where any road would be coming from at that location. The Big Trees Hotel was below the booth to the left. Now there is a better identical image online that crops the tall trees and shows a little more detail (you probably are already looking at it), and we are speaking of the "about 1890" photo from the San Francisco Maritime Museum; I'm suggesting that directly behind that last pole at the end of the platform, a road, fenced on both sides. Also, the "Down the Track" image - by Frank B. Rodolph, and currently on the Big Trees Landing page - shows the undulating terrain and possibly a pipe to carry water from a stream-fed holding tank down to the hotel - a gravity system for their needs. The 1932 map on the 'curiosity' page shows a road, and that the hotel was north of any other buildings while being rather close to the tracks. The 1931 Santa Cruz County map shows a straight line dividing the Santa Cruz County Big Trees property from the Henry Cowell Lime and Cement Company property. By 1932 there is a 2.469 acre area, purchased by Arthur Brisbane, directly across the tracks (east side) from the park. Did the county sell this piece, and what use could it have for an individual? Road access to this spot would be difficult to almost impossible. Who was Arthur Brisbane, and what were his plans? I'm seeing a 202 foot siding from the earliest years to the last years. Southern Pacific must have changed their definition to include track farther from the stations, possibly overlapping with another station's claim to trackage, in order to reach such measurements. The 519 foot siding certainly wasn't an extension out here in the forest, and should be a warning for all other areas where photographic evidence is even more rare. From what collection did you obtain the c. 1890 image of Big Trees Station from the San Francisco Maritime Museum? Thank you.